Rancho Palos Verdes CA takes its name from a tree, the blue palo verde. Real estate in this affluent suburb is highly coveted for its amazing location atop the hills and bluffs of the Palos Verdes Peninsula, as well as for its sweeping Pacific Ocean views. While you’re breathing all that fresh sea air, are you taking in asbestos at the same time? If you have an older home, this is entirely possible. 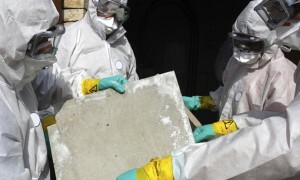 In order to avoid falling ill due to asbestos contamination, you need asbestos removal Rancho Palos Verdes CA. Asbestos-containing materials like insulation, flooring, ceiling tiles, and roofing materials can release hazardous dust when damaged. It doesn’t matter whether the damage occurs naturally over time or suddenly during a remodeling project. As soon as the asbestos fibers come loose from their matrix and get inhaled, they can cause problems as severe as cancer. If you have damaged asbestos materials in your home, or if you simply want to remove old materials during a renovation, you will need professional asbestos removal Rancho Palos Verdes CA. One of the most sensitive areas to remove asbestos from is your ductwork. While it probably once seemed like an excellent idea to wrap ductwork in flame-retardant asbestos insulation, now we know that this was actually a very risky move. As the insulation ages, it can begin to break down, and asbestos fibers can make their way into the ductwork. Then they will get whisked through to other areas of your home, and pretty soon you have a major cleanup job on your hands. At AQHI Inc., we know how to safely perform asbestos duct removal Rancho Palos Verdes CA to prevent contamination from spreading. It doesn’t do you any good to have the asbestos-containing materials removed if the work isn’t done properly. At AQHI Inc., we ensure that safety remains a top priority at every stage of the removal process. We seal off the area and filter the air to keep stray fibers from escaping the work zone. We also bag all waste and then decontaminate the outside of the bags before transporting them outside the work area. Once the materials are removed, we thoroughly clean the area and perform final air filtration to be doubly sure that we’ve done the job right. Our asbestos removal office for Rancho Palos Verdes CA is open Monday through Friday between 8:00 AM and 5:00 PM and closed for lunch from noon to 1:00 PM. With advance notice, projects can be scheduled for weekends, early mornings and evenings.